I finally had an opportunity to paint a beagle! This is Socksie, a very sweet girl, who is dearly missed by her family. While I wasn’t able to meet her in person, I had many photos to work from that showed her playful, happy nature and beautiful beagle markings. Here’s a peek at the portrait in various stages. 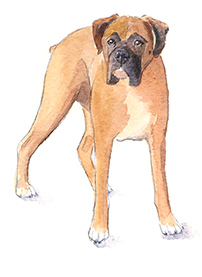 A basic sketch establishes shapes, angles, and proportions of the dog’s body. Then a value study helps me understand her form, markings, and how she will fit into her environment. These first two stages involved some input from my client, which is an essential part of my process. I won’t move on to the painting until the preliminary drawing accurately shows the dog’s unique appearance and personality. After selecting my color palette (described in more detail below), I transferred the drawing to watercolor paper and began laying in color, from lightest to darkest. For Socksie’s portrait I needed to be able to make (1) summery greens for the grass and (2) the correct shades of amber and brown for her fur. I always choose my palettes around blue – Which blue will give me the colors I need? Ultramarine (made dull greens) and cobalt and cerulean (not dark enough to make dark gray) were immediately ruled out. I also experimented with phthalo blue, and that was pretty close – it made some nice greens, but not quite the right browns (see below, left). I settled on Holbein’s royal blue (above, right). Mixed with burnt sienna, it made rich browns that ranged from rusty brown to a very dark and neutral gray. See that dark bluish gray? That’s exactly what I needed for the shadowy parts of Socksie’s back, side, and tail. Mixed with a bright lemon yellow, royal blue made a variety of greens. And by mixing the lemon yellow with burnt sienna, I found the warm, earthy golds and oranges necessary to show the sunlit parts of Socksie (on her face, ears, and right shoulder) and her grassy environment. For her pink tongue, a fourth pigment was needed – just a touch of cadmium red. So that’s it – 4 pigments in this entire painting!